Ethiopians have 12 months of 30 days each. Some of you will have noticed immediately (I know who you are) that this only adds up to 360 days. They tack on another five days as a special short month. (This, by the way, is why Ethiopia’s tourism slogan is “13 months of sunshine.” Hah. More about the sunshine another day). It’s not only the months they figure differently. Ethiopian Orthodox also have a different A.D. start date than the western branches of Christianity. By their count we have just launched into the year 2005. 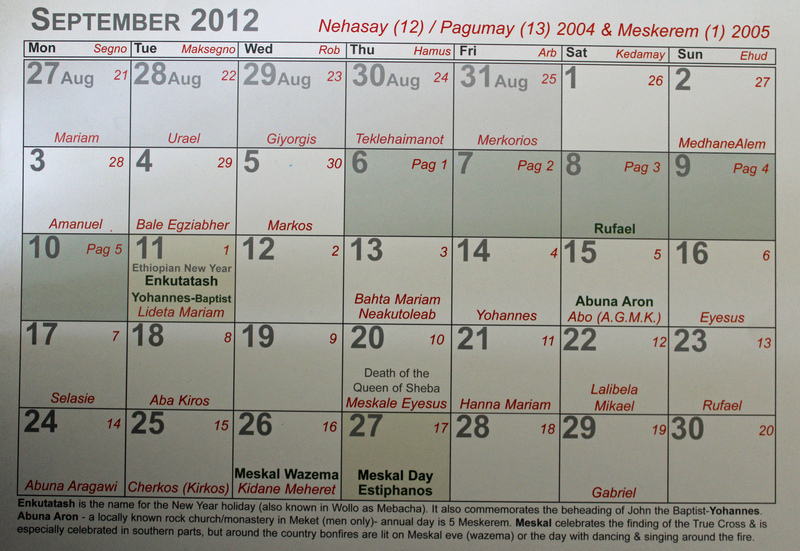 The new year holiday is called Enkutatash, and this year it fell on September 11. We got the day off. Traditionally, families have parties where girls sing and are given money by their relatives. Nowadays most people celebrate new year’s eve the same way we do on December 31. This month on my Ethiopian-Gregorian calendar. Ethiopian dates are in red, Gregorian in black. 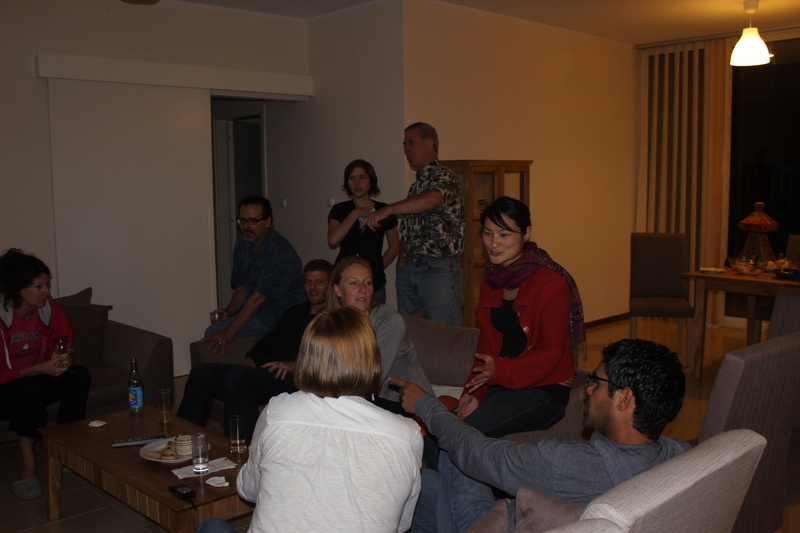 The Sheraton Hotel – the elegant faranji place in this city – has a party and shoots off fireworks at midnight. Which is a little strange, given that the Ethiopian clock is six hours off ours. The Varnero faranji skipped out on the Sheraton event in favor of an at-home celebration, for which Andreas and I volunteered our apartment. 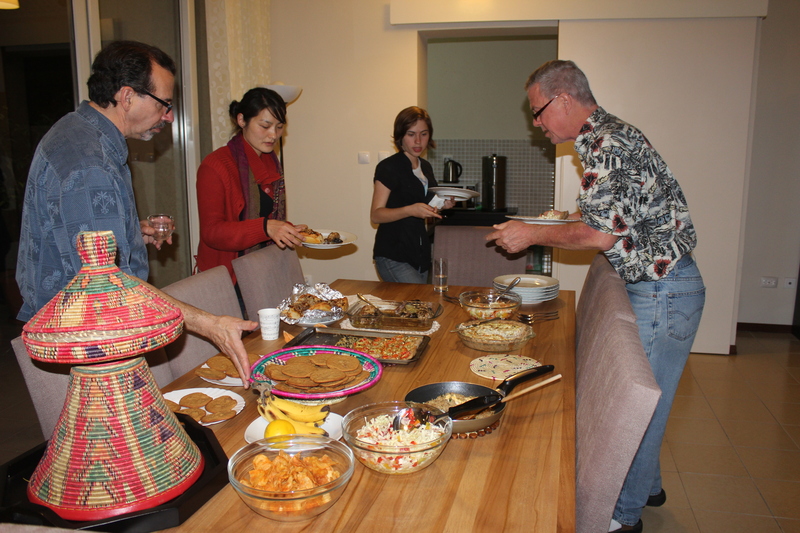 It was a potluck, with an interesting assortment of home-cooked contributions interspersed with a couple of housekeeper-made dishes. We faranji newcomers are still getting the hang of local ingredients and local cooking tools, not to mention the high altitude effect, so many dishes came with a side of apologies. No champagne here, either, but we washed it all down with South Africa boxed wine and some local ouzo, and I think everyone went home pretty satisfied. I wish I had been there to share the celebration. I love the different calendar. Me too, Jenni – you’re always the life of the party!